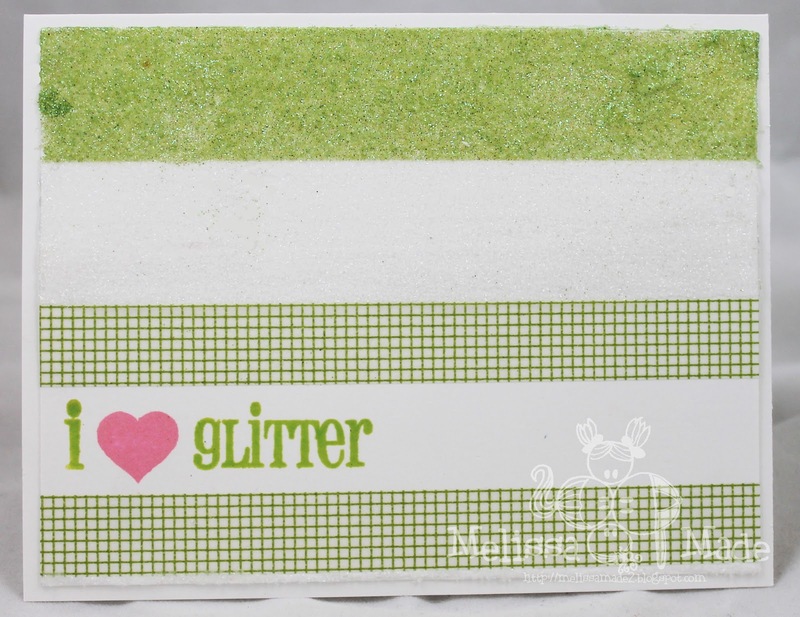 Melissa Made: I HEART Glitter! I know you do too! I HEART Glitter! I know you do too! Hi ya everyone! Today, I have a simple creation I made using some fun ink at SP & Company. I used the awesome Avocado green and Flamingo Pink for the I love glitter stamp. The sentiment is also from SP & Company and comes in the Glam Girl Emma set. I have a question for those of you that do use glitter on your cards. How do you get it to adhere in a nice even coat? I used my tape runner but it's often hard to get it to go on nice and smooth. I love the look of this card but wished that the chunky spots wouldn't have happened. Tell me, what's your method of attaching LARGE areas of glitter! Good morning. Love your great little card... I use my Zyron or glossy accents. Then I press the glitter in before and let it sit for a minute before I shake it off. Miss you!